Document Navigator is an easy to use, intuitive document capture, store and manage solution, that will save your business time, effort and money by automating daily work routines. The OCR capabilities allow documents to be scanned and turned into textual content that is editable, extractable or searchable content. OCR creates living documents that include searchable PDF, MSWord & Excel. Once processed, a document is easily found on your network, using simple search tools inherent within your Windows machine. Certain industries have legislation that forces them to retain documents for a set period of time. For some businesses, this would result in large areas of storage being assigned to document archives. Tracking down documents in this environment is a time consuming task, and subject to flaws. Electronic document storage reduces your time in managing documents, and the space required for physical storage. All documents become instantly searchable from your desktop, and can be made available 24/7 from anywhere, providing the user logs into their Windows environment. This greatly improves the flexibility of a business to operate a distributed workforce, thus reducing the need to have all employees under one roof. Document Navigator is a software solution that sits on your Windows operating system, and uses APIs to connect to your Konica Minolta multifunctional bizhub device (MFP). Pre-defined, selectable rules allow documents to be scanned and stored according to the work-flow selected during scanning. Hot folders are created on the network, as part of your pre-defined work-flow, and are monitored for content arrival. Every archived or stored document at your fingertips - Anytime - Anyplace - Anywhere! Bar Code - a simple bar code can be added to documents or added to a lead header page for the document bundle. The bar code contains a unique identifier that distinguishes the documents being scanned. This could be in the form of a client name, for example. The bar code is scanned and recognised by Document Navigator, and the selected work-flow is applied to the process. 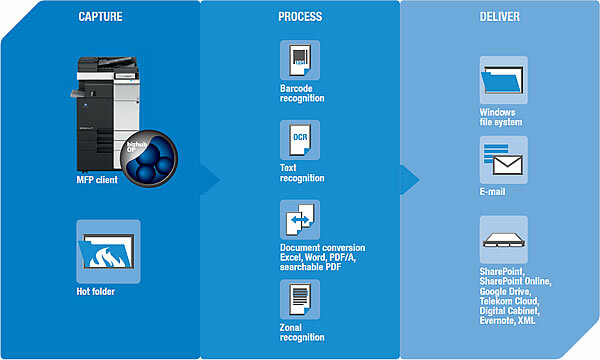 MFP-embedded: Workflows start directly on the panel of the multifunctional bizhub device (MFP). This provides a convenient means to enter additional workflow information if required, such as naming the document, selecting destinations, adding metadata. Limitation of scanning options: The administrator can assign scan settings to specific workflows, for example to control the file size for storage. In this case, he might only permit the use of larger resolutions for important graphical documents and determine b/w scanning for documents and workflows that do not require digital colour output. Windows folder structure: Documents are captured from predefined Windows folders. Whenever a document appears in the specified folder, it is automatically picked up and processed according to the workflow specification. Document Navigator Essentials from the bizhub device only to users who authenticate with their Windows or Active Directory details. Reliable OCR text recognition: Thanks to the ABBYY OCR engine, textual content is reliably recognised in electronic and paper documents and transformed into editable, extractable or searchable content. Popular file formats: Automatic conversion into the most popular electronic formats is supported, including Word, Excel, PDF, sPDF, JPEG, TIFF, XML, PDF/A. Barcode recognition: With the integrated barcode reader, 1D barcodes can be read and the recognised values used for document processing. In addition, documents can be separated by inserting sheets with barcodes before scanning. Users can thus combine multiple documents into a single scan job. The barcode separators ensure individual processing. Zone recognition: This enables recognition according to predefined zones. This capability is extremely useful for automation, since content can be read out and set for example as metadata or included in the document name. Image improvement: Empty pages are automatically detected and deleted. And if the scanning of a document is not completely straight, any slant is corrected with the automatic page rotation. selected on the MFP panel or are automatically addressed according to the workflow specifications. Connectors to most popular solutions: Documents can be stored in several systems, including SharePoint, SharePoint Online (Office 365), Google Drive, Telekom Cloud, Digital Cabinet, Evernote, and others. Even an XML generator is provided, ensuring support of most electronic systems. E-mail address: The forwarding of digital documents to any internal or external e-mail address is easy, with the address either pre-set or selectable in the MFP panel. In Document Navigator Essentials, even small e-mail address books can be configured.